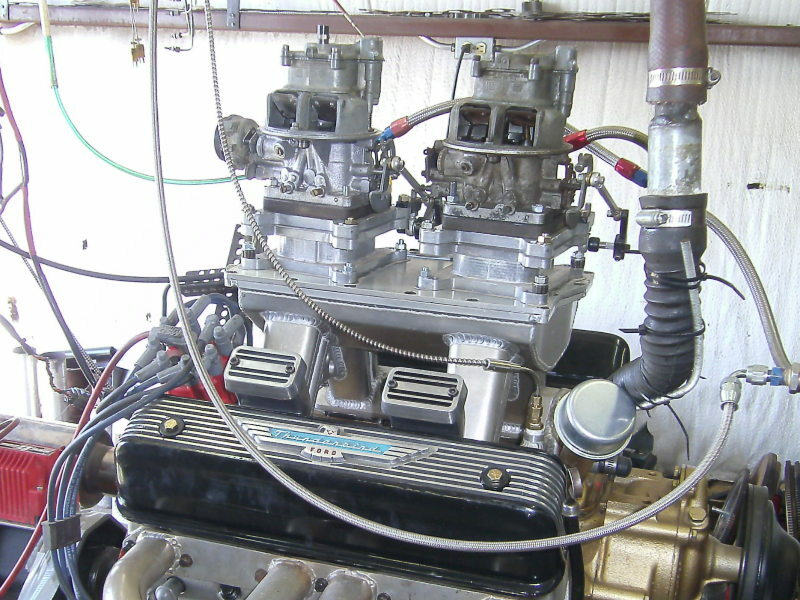 With the iron 113 heads on the dyno mule, the Edelbrock #257 2X4 intake that had been ported by Joe Craine did exceed those numbers generated by the stock Mummert intake and single four barrel carb combination. 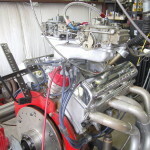 Now it was time to install the aluminum heads on the 312+ dyno mule and see how those same dual quad manifolds would fare. 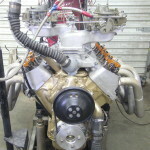 As a result of changing the ported iron ‘113’ heads to a pair of CNC ported Mummert aluminum heads, it was necessary to establish a new target baseline. 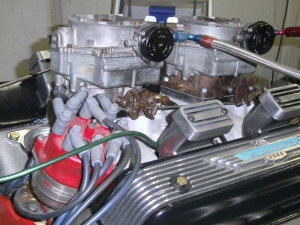 The same stock Mummert intake and 750 cfm vacuum secondary Holley that had been used for the iron head baseline was again used for the aluminum head baseline. 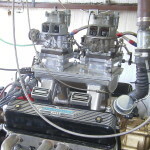 While the iron heads made a peak number of 311 HP in the single four barrel format, the aluminum head baseline jumps to 375 HP with nothing but a cylinder head change. This does give the dual quad intake testing a much higher target value to aim for. 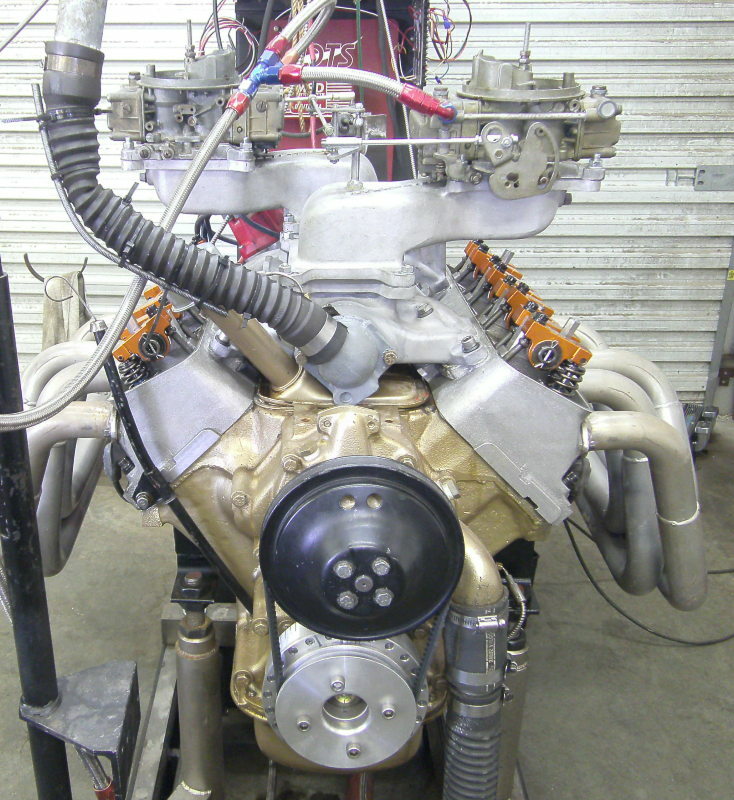 The dual quad intake testing with the aluminum heads now gets more definitive simply due to the flow restrictions that were taking place in the iron heads being minimized. 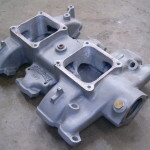 This will allow any flow restrictions in the manifolds and carb pairs to come to the forefront. 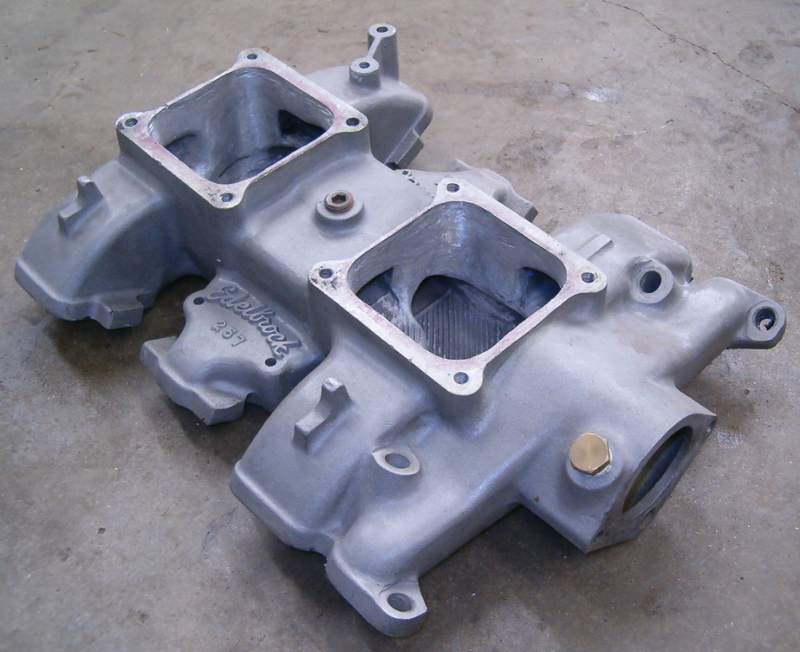 With that in mind, the same intakes that were run on the iron heads are also run on the aluminum heads. 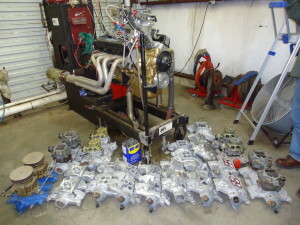 But added to the fray are also the Fenton, Edmunds, Hogan, and the ported Edelbrock FM255 intakes among others. Here is a quick summary of how the different intakes performed on the aluminum heads without getting into the various carbs or other variables that were tested on each intake. This particular list is ordered from worst to best using the best carb combination for each intake that was tested. So with that being said, here are the breakdowns for each manifold that was tested. The manifolds are now listed in the order in which they were run and tested on the 322” mule engine. Click on picture for larger images. 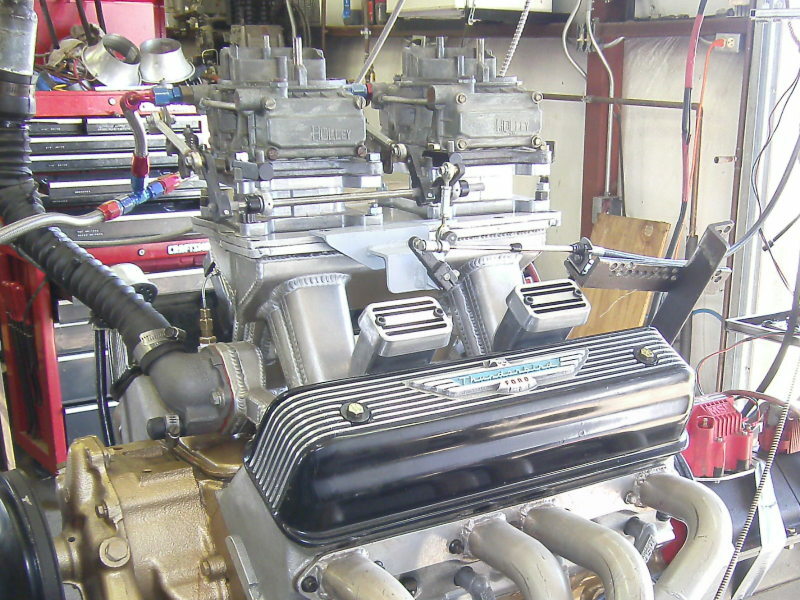 Upon establishing the single four barrel baseline value, the Edelbrock #257 intake that had been ported by Joe Craine was the first of the dual quad intakes to be reinstalled on the aluminum headed +060 over 312. 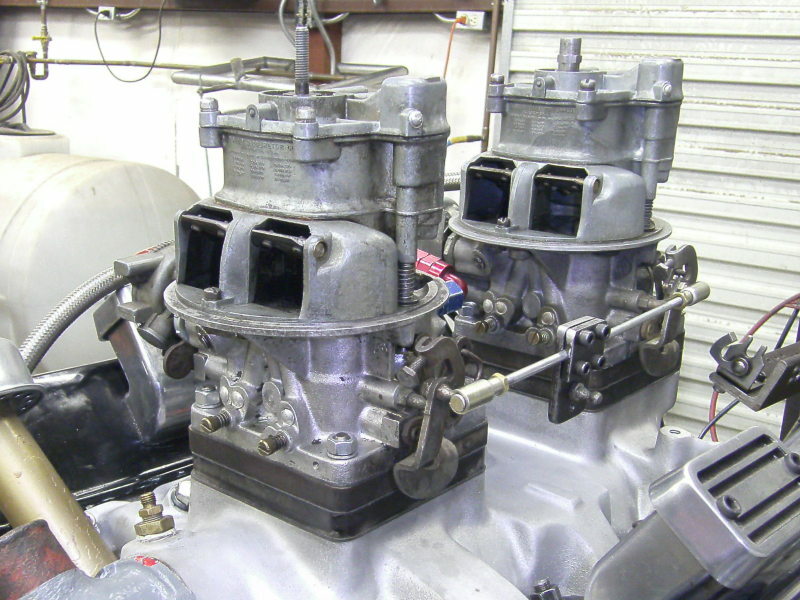 While that particular intake was the best of the lot on the iron heads and actually exceeded the baseline target for those heads, it came up just shy of the revised baseline or target for the aluminum heads. This intake was tested with several pairs of carbs and here are the results for the best tuneup for each pair of carbs. 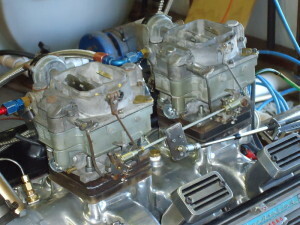 I’ll add that jetting changes on two carbs and especially the Teapots can be very time consuming. 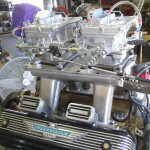 Next on the list was the hard to find 1956 Mercury dual quad intake. 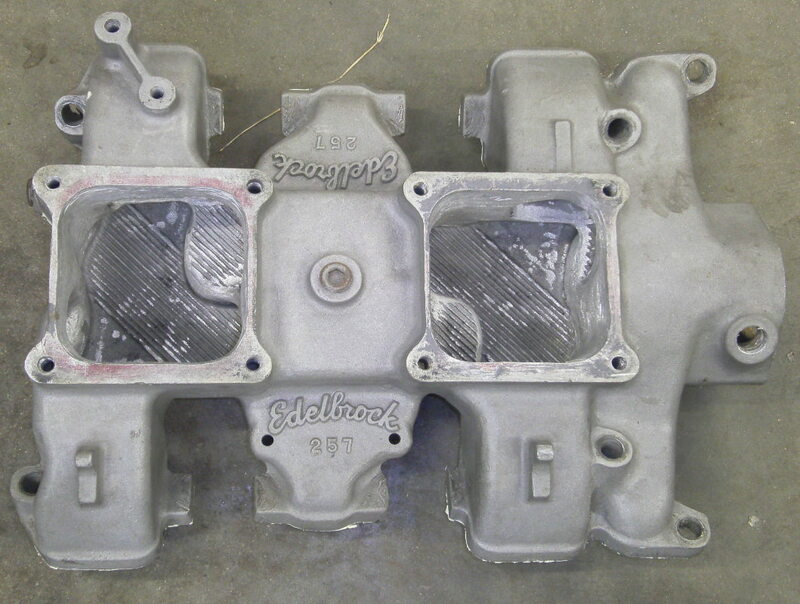 In looking at this manifolds outward appearance, this one was originally based on the Edelbrock FM255 intake. There was already some prior port work performed on this intake and based on its overall performance, it was a good performer back in the day. Here are the results with a variety of carbs tested upon it. 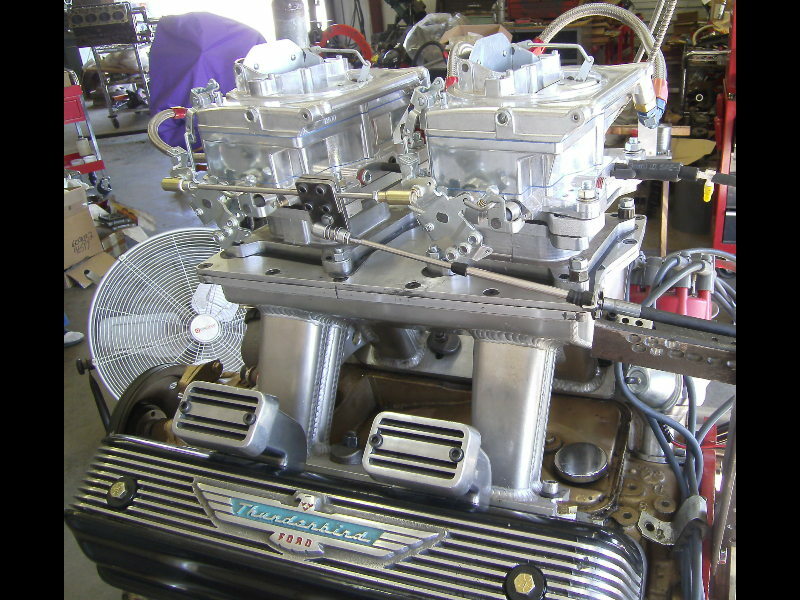 This was the ’56 Ford offering which had the center to center carb spacing much closer together than the ’56 Mercury intake that was just tested. 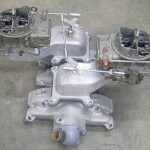 The rear carburetor sits further forward on this manifold and appears to be more flow restricted as a result. Here are the results for this intake. 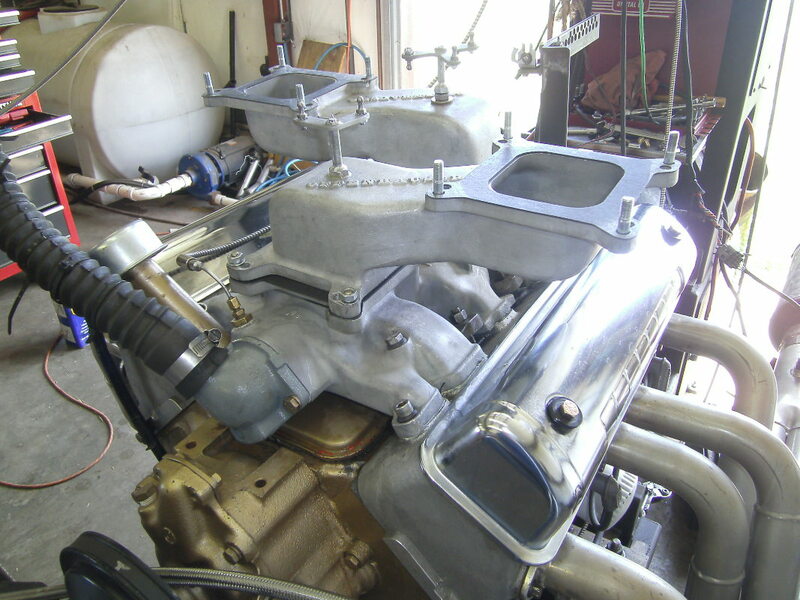 Another 1956 Mercury 2X4 intake but this time it’s a stock and unmodified version. Here are the results. 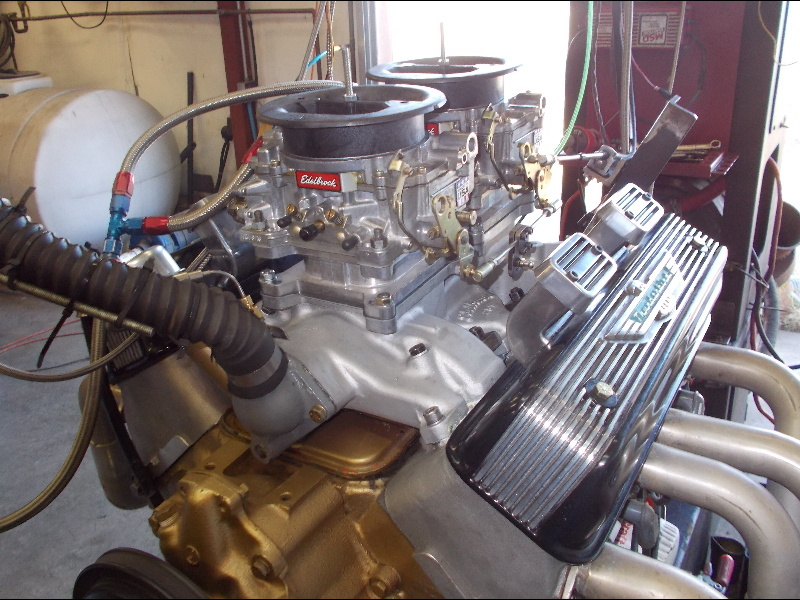 This is the Edelbrock intake originally designed for the ‘55/56 heads and was the predecessor to the highly touted Edelbrock #257. This intake is also the basic design for the 1956 Mercury dual quad intakes which also posted similar performance numbers. Here are the results. Here are the results for the Fenton intake which was an unmolested version (no porting). 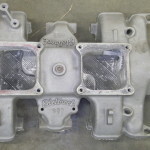 This intake has ‘D427’ cast on its bottom which leads me to believe that many of the Fenton manifolds were using some of the older Edmunds molds in which to cast them up. Same drill, just another intake. 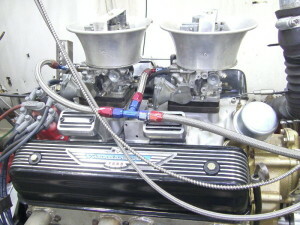 This time it’s with an Edmunds intake with the ‘D427’ part number cast on its bottom. And now back to the 1956 Ford dual quad intake but one that has been heavily ported in the plenum openings somewhere along the way. 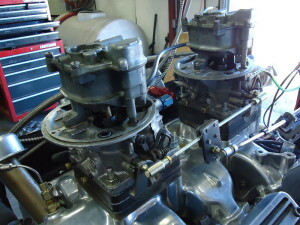 The carb openings themselves had been enlarged to accommodate carb adapters to fit later model carbs to it. The individual four carb bore holes had been converted to the kidney shaped holes as found on the 1957 ECG 2X4 intake manifolds. 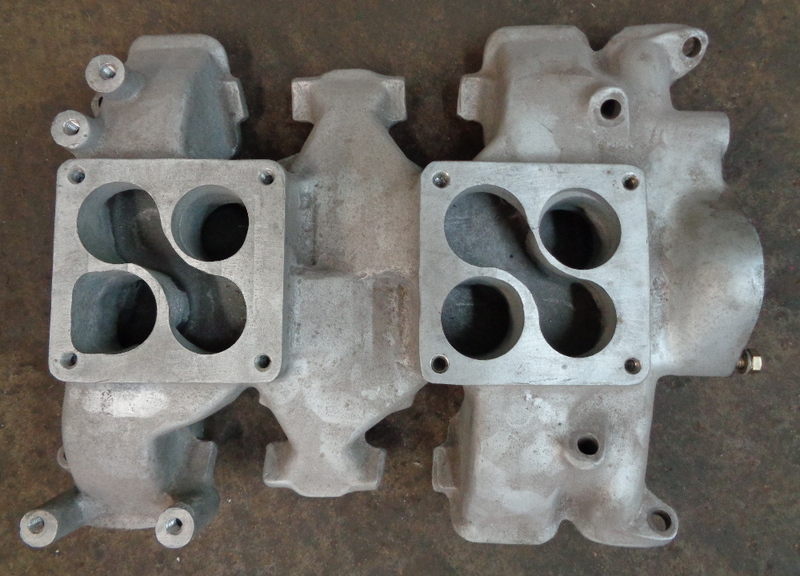 This particular manifold had also been heavily milled on the intake gasket surfaces which had the port openings smaller than they needed to be. 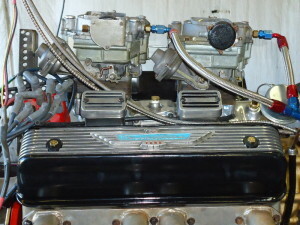 This was a unique piece that falls in the sheet metal intake category and had been drag raced previously on the Church Brothers 1955 Thunderbird with much success. On their iron headed engine, it had made a best of 490 HP but when replaced by a nicely ported Blue Thunder intake with a single four barrel carb, 510 HP came to the forefront. While the Hogans intake is in the shop to see what can be done to its innards (plenum mods) to get it back on par with the single four intake, it is being run again with its ‘as supplied’ plenum with a myriad of carb pairs as part of this dual quad test. Here are the results. 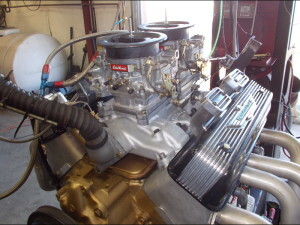 The Edelbrock 257 has long been considered to be the gold standard of YBlock dual quad intakes. Here are the results for the stock Edelbrock #257. On this particular intake, the plenum dividers under each carb had been completely removed which played havoc with the carburetor signal. This intake had been run previously on the iron heads and was the worst performer of the manifolds tested on those heads. 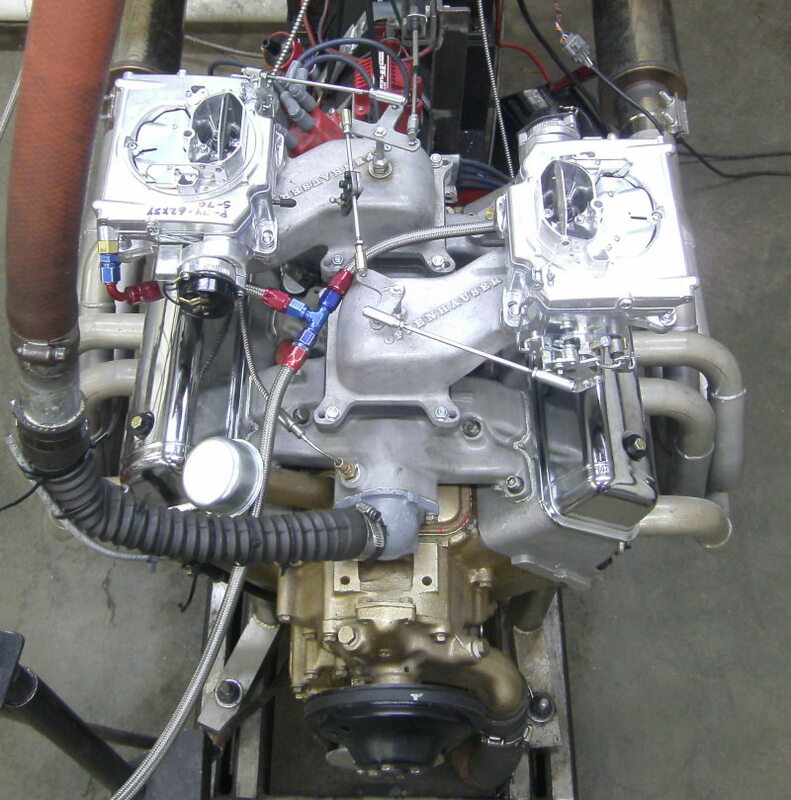 It did not fare much better on the aluminum heads while low end throttle response proved to be even worse with the better flowing aluminum heads. 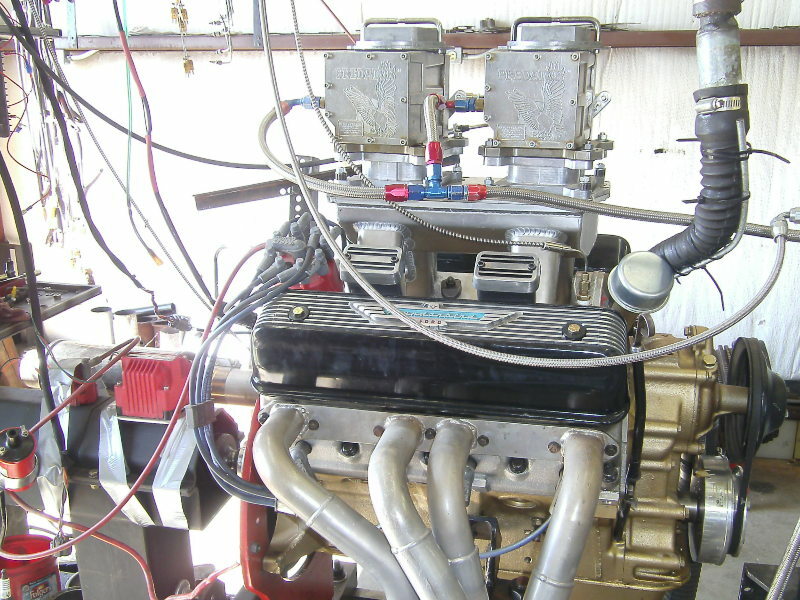 As a result, dyno pulls had to be started at 3500 rpms rather than the normal 2500 rpm start. 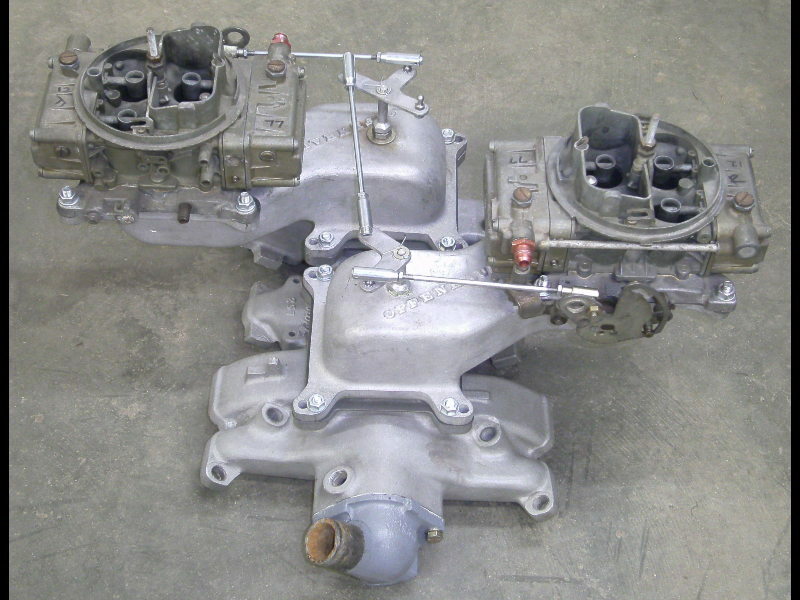 While one pair of carbs were run on this manifold in an inline setup, a pair of Offenhauser crossram adapters were also utilized and tested in an effort to help save the manifold. Here are the results. Those open plenums were not at all happy with the carbs sitting directly above them. 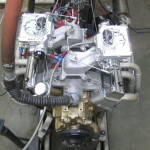 Installing the crossram adapters which both lengthened the runners as well as shielded the bottom of the carb directly from the ports was worth an easy 67 horsepower. Even with a 67 HP gain, that manifold still comes in at the lower performance end of the list and still lower in output numbers than an unmodified #257 intake. The lesson here is to be cautious in porting these manifolds as it is quite easy to go the wrong direction when attempting to increase the power levels. 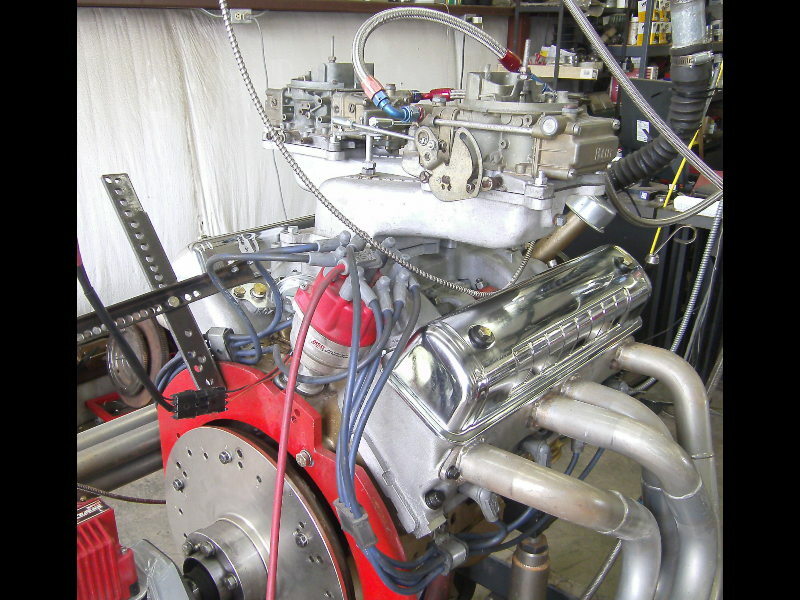 With the results being much better with Joe Craine porting the Edelbrock 257, it was decided to also see what Joe could do with the Edelbrock FM255 intake. The stock FM255 actually performed better than the stock 257 so it stood to reason that a ported FM255 might also perform better than a ported 257. Here are some of the results. But this is where things get interesting. It’s observed that the mechanical secondary carbs have some severe reversion coming back up through them when loading the engine at 2200-2500 rpms. 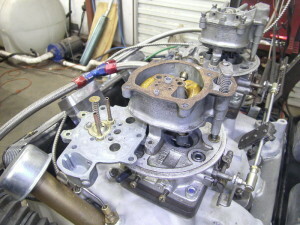 To alleviate this, a 2” HVH tapered carb spacer is installed under each carb. But going with what Joe Crane had seen in some air flow testing, the spacers were tested in both the conventional right side up configuration and upside down. The upside down configuration looked like a better fit to the four holes existing in the carb adapters that were being used to accommodate using modern carburetors on the teapot flanged intake. 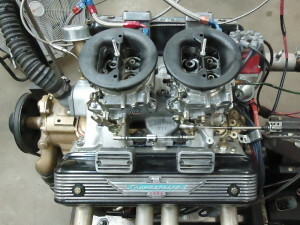 The spacers being upside down peaked at 372 HP with the 660 cfm carbs. Regardless of looking better, the spacers being right side up while using the same carbs netted 378HP. That’s a 6 HP change that didn’t cost anything but the time it took to reverse the spacers. It becomes obvious at this point that there is no end to the number of variants that can be tested. 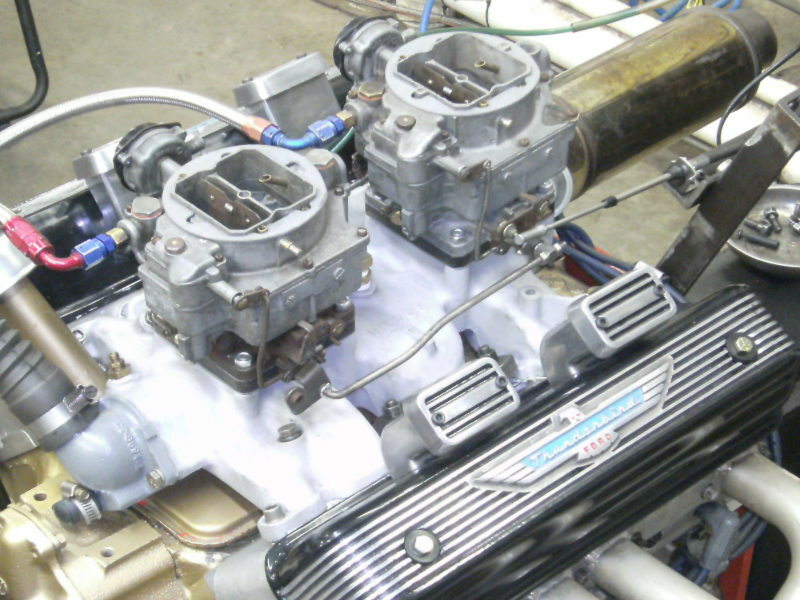 With the same L9776 450 cfm Holley carbs reinstalled but with the upside down HVH spacers now under them, there is an eighteen horsepower increase. 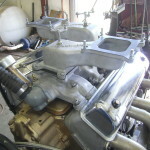 That’s pretty substantial for just a pair of carb spacers being installed. The pair of 660 cfm center squirter Holleys are then bolted on with the spacers being tested in both positions and the performance again steps up another notch. Here are the final numbers for both sets of these carbs. 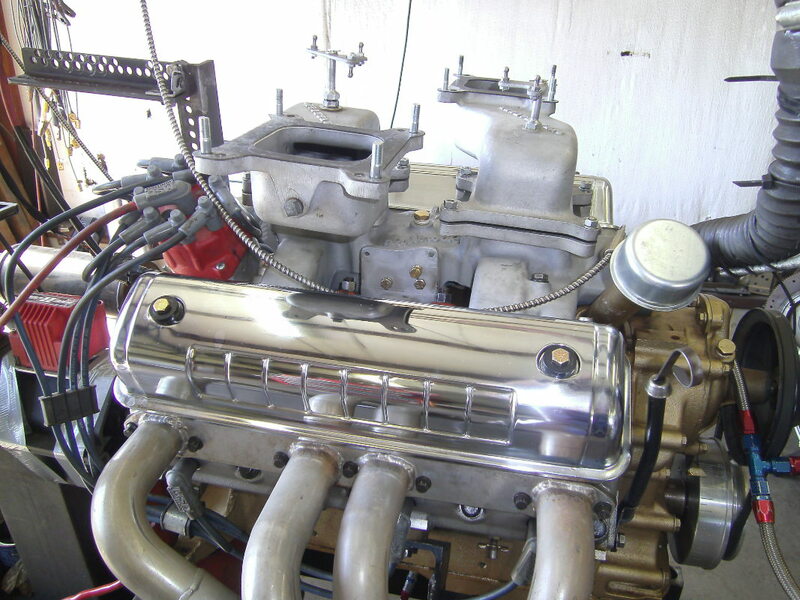 The Offenhauser crossram adapters worked so well on the ‘hogged out’ Edelbrock 257 intake that it was decided to also try them out on a manifold that was already at the top of the field. 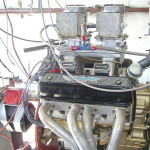 In this instance and on the ported FM255 intake, performance went backwards. Here are the numbers. And this manifold completes the dual quad testing. It’s tested only with two different pair of model 4000 Holleys (Teapots). Here are the numbers. Although I was on the trail of a couple of Edelbrock M254 intakes to also include in the testing, getting either of the intakes here for the test just didn’t happen. 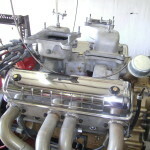 The M254 2X4 intake was designed for the smaller port Ford 239 and Mercury 256 heads so I suspect it would have really been flow restricted on the aluminum heads. Without actually testing that particular manifold, I can only guess that its performance would have been on par with the Fenton and Edmunds intakes. 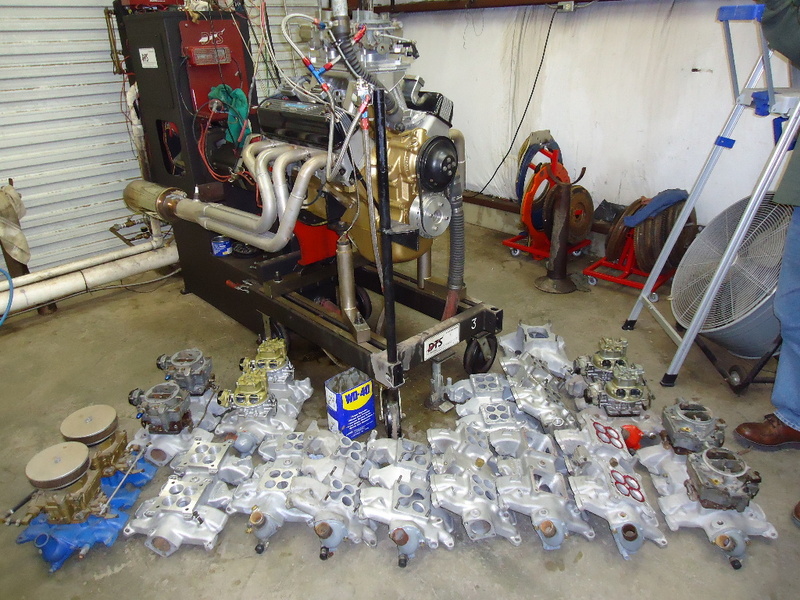 One thing that became clear throughout these tests was what worked for carburetor pairs on one intake manifold did not necessarily work for another intake. While the Lincoln Teapots performed quite well on some of the basic low rise dual quad intakes, they failed miserably on the tunnel ram. 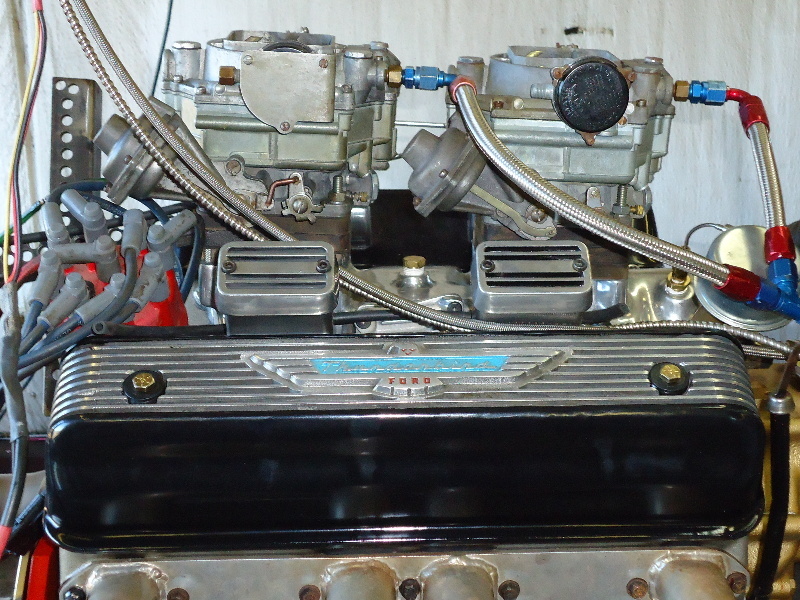 On that particular intake manifold, two different sets of Lincoln carbs were used and both sets simply would not throttle up properly. It’s a good guess that there was just enough reversion from those short and straight runners to be upsetting the metering in those particular carbs. The carbs essentially sit right on top of the runners on that particular setup. But the pair of 1956 Teapots (List #1161-2) with the Karol Miller modifications shined in that particular application. Still trying to figure that one out but the internal secondary vacuum signal has been altered significantly on the KM modified Teapots which may be compensating for any reversion taking place. The 660 cfm center squirter Holleys also worked very well on that intake as compared to some of the other carbs tested but that was the application for which they were specifically engineered. But on the throttle up, all eight barrels were wide open on the 660’s versus only four barrels initially open on the vacuum secondary KM modified Teapots. Lots to think about. So there you have it. Most of the dual quad intakes that were available for the Y have been tested and compared against each other. Only in the best of circumstances did a dual quad setup exceed those performance baseline values established by a stock unported Mummert single four barrel intake. 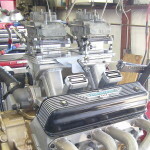 Porting definitely works but if running aluminum heads, you do have your work cut out in getting the air flow numbers high enough in the dual quad intakes to match the cylinder head flow. The next installment of the dual quad testing will cover the results derived from testing the various dual quad air cleaners. Stay tuned and until next issue, happy Y motoring. Ted Eaton. This article was originally published in The Y-Block Magazine, Issue #116, May-June 2013.